Attorney General Jeff Sessions spoke about the opioid crisis on Thursday in Concord, N.H.
Attorney General Jeff Sessions on Thursday targeted Lawrence for criticism during his speech in New Hampshire on efforts to combat the national opioid crisis. Sessions said “there can be no sanctuary” for fentanyl dealers. There’s no official definition of a sanctuary city, but in general such municipalities do not allow their police departments to help Immigration and Customs Enforcement, or ICE, detain and deport immigrants. The Justice Department last year sent Lawrence’s police chief a letter warning that a city policy may be violating a federal statute that requires information-sharing related to immigration enforcement _ which would put the city at risk of not receiving public safety grant funding. “I’m repeating my call on Congress to block funds for sanctuary cities and to close the deadly loopholes that allow criminals back into our country and into our country in the first place,” the president said. 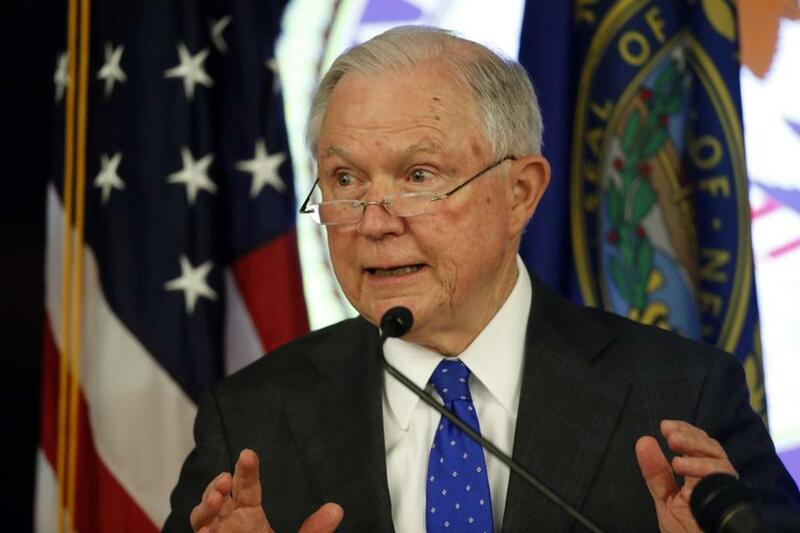 Sessions said “enforcing our drug laws has never been more important than it is today” and that the stepped-up prosecution at the federal level will target traffickers, rather than users. “We want to go up the chain,” he said, adding that the Trump administration wants to cut the number of opioid prescriptions by one-third within the next three years. Earlier Thursday, a coalition of advocates said they would be staging a rally dubbed “Health Care, Not Prisons” outside the courthouse to demand access to good health care and recovery services. Sessions conceded during his speech that law enforcement isn’t the only tool available to fight the overdose surge. Trump declared the opioid crisis a public health emergency in October 2017. In March, Trump returned to New Hampshire, a state he referred to as a “drug-infested den” in 2017, to tout a plan for prevention that included cracking down on dealers and reducing opioid prescriptions. More than 1,800 people have suffered fatal overdoses in New Hampshire since 2013, according to data released in January by the New Hampshire Drug Monitoring Initiative. Material from The New York Times and Associated Press was used in this report. Matt Viser and Maria Cramer of the Globe staff and Globe correspondent Aimee Ortiz contributed.